Wreck-It Ralph is heading back to the big screen, and this time, he's wrecking the internet. 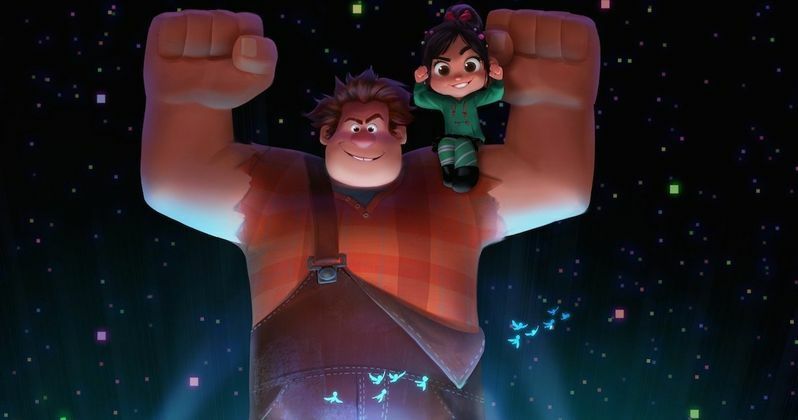 The Oscar-nominated Walt Disney Animation Studios team from the original film is reteaming for the follow-up Wreck-It Ralph 2, including director Rich Moore (Zootopia, The Simpsons) and producer Clark Spencer (Zootopia, Bolt). Phil Johnston (writer, Wreck-It Ralph, Zootopia, Cedar Rapids) joins Moore as director and a writer on the project. John C. Reilly and Sarah Silverman return as the bad-guy-turned-good, Ralph, and the girl with the game-winning glitch, Vanellope von Schweetz. The untitled sequel will hit theaters-literally-on March 9, 2018. The filmmakers and Reilly made the announcement on Facebook Live today. To accommodate the new Wreck-It Ralph sequel, Disney has shifted the release date from March 9, 2018 to November 21, 2018. Here's what director Rich Moore had to say in a statement about this upcoming animated sequel, which he has been developing it since shortly after the release of the first film, and while directing this year's critically-acclaimed hit Zootopia with Byron Howard. "From the moment we started working on the first Wreck-It Ralph, we knew there were so many possibilities with these characters, This time, Ralph's wrecking wreaks havoc on the Web-as only he can do. Characters we loved in the first film are back and we are ecstatic to be working with them-and the actors who voice them-once again." When Wreck-It Ralph opened on Nov. 2, 2012, it turned in the highest opening weekend ever for a Walt Disney Animation Studios film at the time of release. Nominated for an Oscar and Golden Globe® for best animated feature, Wreck-It Ralph won the PGA Award for outstanding producer of an animated theatrical motion picture as well as five Annie Awards, including best animated feature, director, cast and screenplay. The film was named best animated feature by the Broadcast Film Critics Association, earned outstanding achievement in casting for an animated feature by the Casting Society of America, and won the Kids' Choice Award for favorite animated movie. Here's what Phil Johnston had to say in his statement. "The world of the internet is the perfect place to send Ralph and Vanellope. The scope and scale are so vast and the possibilities for comedy are endless." The original Wreck-It Ralph took in $189.4 million domestically and $471.2 million worldwide at the box office from a $165 million budget. The story followed John C. Reilly's title character, the villain of a popular arcade game who wants to be a hero. He tries to sneak into a modern, first-person shooter video game, featuring tough-as-nails Sergeant Calhoun (voice of Jane Lynch), which Ralph sees it as his ticket to heroism and happiness. He sneaks into the game with a simple plan-win a medal-but soon wrecks everything, and accidentally unleashes a deadly enemy that threatens every game in the arcade. Ralph's only hope is Vanellope von Schweetz (voice of Sarah Silverman), a young troublemaking "glitch" from a candy-coated cart racing game who might just be the one to teach Ralph what it means to be a Good Guy. Here's what John C. Reilly had to say about returning to voice Ralph again. "Ralph is a character very near and dear to my heart. I'm really looking forward to playing the big lug again. Making the first Wreck-It Ralph was one of the most special experiences I've ever had and I'm really looking forward to bringing him back to life. So many kids I've met all over the world are excited to see him again, too. They tell me all the time!" At 12 p.m. PT today, Disney's hit mobile game, Disney Crossy Road, will be wrecked by Ralph in celebration of the announcement. As fans play through the 12 different Disney and Pixar worlds of Disney Crossy Road, Ralph may appear and 'wreck' part of their gameplay. Here's what Chris Heatherly, SVP & GM, Disney Apps and Games, had to say in a statement. "Wreck-It Ralph has been one of the most popular worlds to play in Disney Crossy Road, so it made perfect sense to celebrate Ralph's return by letting him go outside his world and 'wreck' other parts of the game. We are big fans of the first film, as are our players, and can't wait to see how the next chapter unfolds." It isn't known yet if Jane Lynch or other Wreck-It Ralph voice cast members such as Jack McBrayer, Alan Tudyk, Mindy Kaling, Joe Lo Truglio, Ed O'Neill, Dennis Haysbert and Edie McClurg will reprise their roles for the sequel. Disney has also released a new photo with Ralph and Vanellope as they prepare to conquer the internet. While we wait for more details, take a look at the photo plus the Facebook Live video where directors Rich Moore and Phil Johnston announced Wreck-It Ralph 2, along with a special guest.